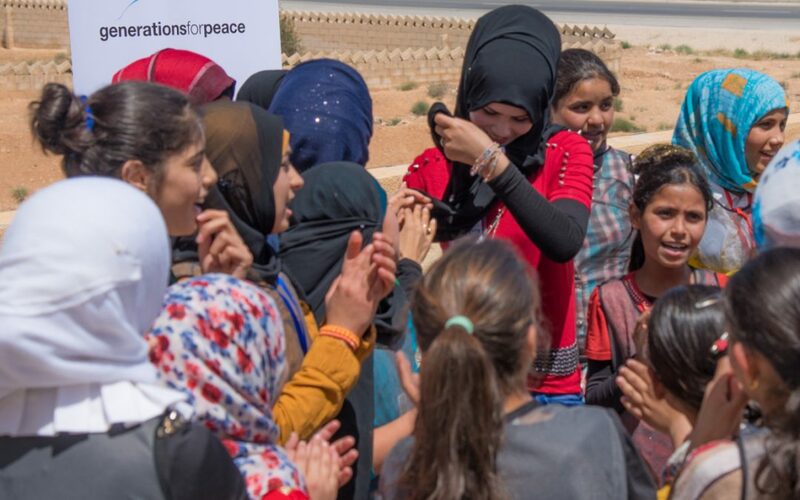 Layan is one of 1600 Syrian and Jordanian girls and boys participating in the Generations For Peace-UNICEF Social Cohesion Programme in Mafraq, Jordan. Every week, they meet at their local youth community centres and spend the day participating in sport and art-based games, which are led by Generations For Peace (GFP) volunteers. These activities help to strengthen social cohesion, break down stereotypes, and reduce tensions and violent behaviours. At age 14, Layan and her family were forced to flee their home in Syria after it was attacked. They had been warned that staying in Syria would become dangerous, but they did not believe it would reach them. Her family had just minutes to pack their necessities and run. They fled to a desert, where they stayed for almost three weeks, waiting for the siege of their city to be lifted. Already five months pregnant at the time of the attack, Layan’s mum made the gruelling trek to the desert with her family, unsure of what medical attention she would find once she left her home. After one week in the desert she knew something was wrong, so she made the decision to return to find the nearest hospital with Layan’s brother. Layan and her family had no time to mourn the loss of her brother though, as they received information that troops were being sent to attack the desert in the morning. Once again, they packed their belongings and made the decision to try to seek refuge in Jordan. They did not have any relatives in Jordan like the other families, but there was no other option. In the middle of the night, Layan, her five brothers, her three sisters, and her parents all walked to the Jordanian border with the hope of restarting their lives there. Luckily, Layan’s family was one of the first waves of refugees that Jordan took in. This meant that Jordan’s border control agents were much more lenient and allowed them to seek refuge without too much hassle. They were then transported to Zaatari refugee camp in Mafraq with the other Syrian families. A chant by the GFP volunteer leader signals the end of this break and Layan jumps up to participate in the next activity. She explains that for this activity, the girls will be put into teams and must work together to complete the assigned task. Each girl is given a clothes peg and is lined up with her team across from a laundry line stretched out by two GFP volunteers. They are told each girl must run to the laundry line and place the clip onto the line using just her mouth. As soon as the game starts, each team starts cheering on the girl running up to the line. Some girls clap, some girls chant, but all encourage one another to run her fastest and focus on placing the clip onto the line. When both teams end, the girls begin cheering for themselves, laughing at how silly they may have looked with the pin in their mouth, and congratulating one another on how well they did. Then, they all turn and listen eagerly for the next activity. *The name of the actual individual and related photos have been changed to protect their privacy.